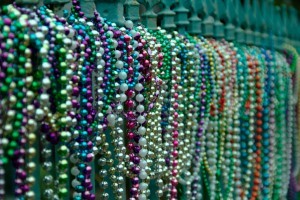 If you visit New Orleans today, you’re likely to see Mardis Gras beads beautifying the city’s ornate wrought iron fences. If you have ever visited New Orleans, you would notice wrought iron fences throughout the city. This goes to show off how old and ornate the city is. During Mardis Gras the wrought iron fences of New Orleans take on a majestic appearance. Both during and after the Mardis Gras celebration, many people hang or wrap their beads on the posts of the city’s many wrought iron fences. If you are in New Orleans today for Mardis Gras, here are a couple fancy fences to check out. The French Quarter is one of the oldest areas of New Orleans. Jackson Square is an historic park that is located in the center of the French Quarter. Overlooking Jackson Square is the St. Louis Cathedral. And surrounding both Jackson Square and St. Louis Cathedral is a signature wrought iron fence. Not only does the fence add an extra layer of security and visual appeal to the park, it also serves as a place for local artists to display their work for sale to passersby. 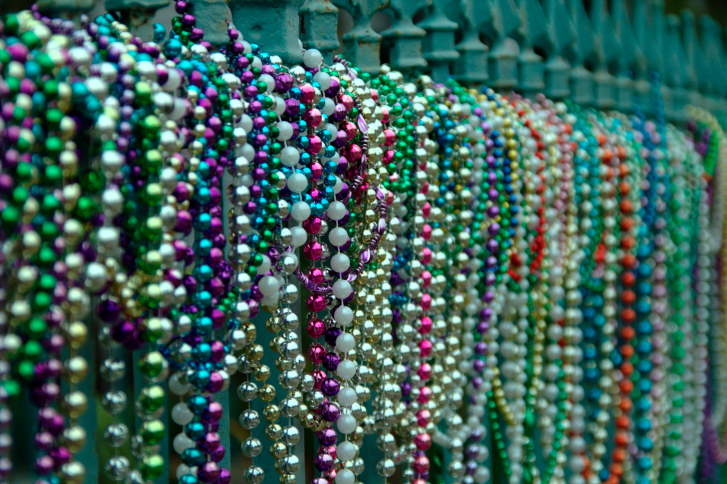 And during Mardis Gras, the Jackson Square fence is adorned with thousands of colorful beads, creating a beautiful and unique scene that you will only see this time of year! On Royal Street in New Orleans you’ll come across a regal Victorian-era house. This is the Cornstalk Hotel, which gets its name from the surrounding wrought iron fence, famous for its intricate cornstalk design. The original owner of the Victorian home had the fence made to look like cornstalks in hopes of staving off his Iowan wife’s homesickness. After the home became a hotel, Elvis Presley would often visit the hotel, which only served to increase the hotel’s popularity. Today, the fence and hotel are famous not only for their famous visitors but also for their beauty. This entry was posted on Tuesday, February 9th, 2016 at 9:40 pm. Both comments and pings are currently closed.